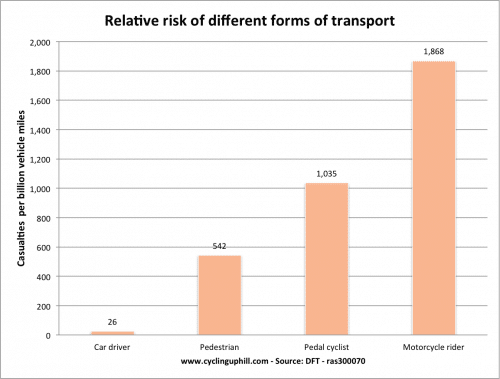 Using fatalities, pedestrians have a slightly worse risk than cyclists. 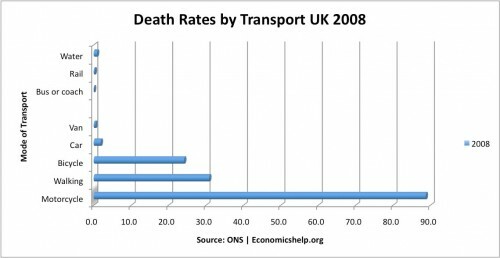 If we include rail, bus and vans, the fatality rates per bn miles travelled is even lower. 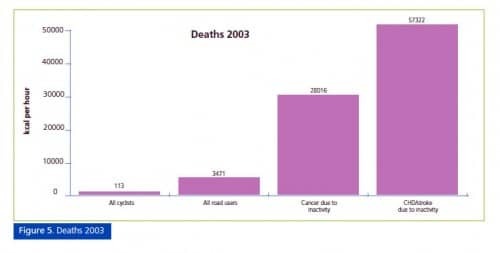 When examining cycle fatalities, a different perspective is to consider the main causes of death in the UK. 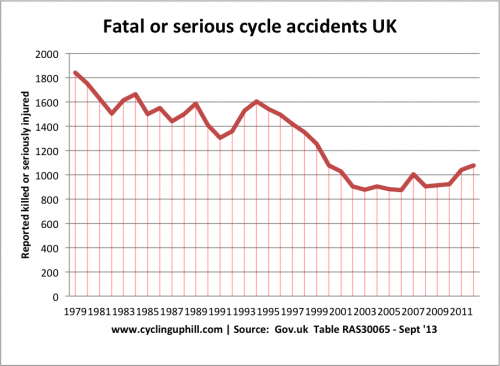 Conclusion – How safe is cycling? Cycle fatalities tend to make headline news – making the dangers of cycling more prominent in people’s mind. It is worth bearing in mind, that it is also dangerous being a pedestrian walking the streets. 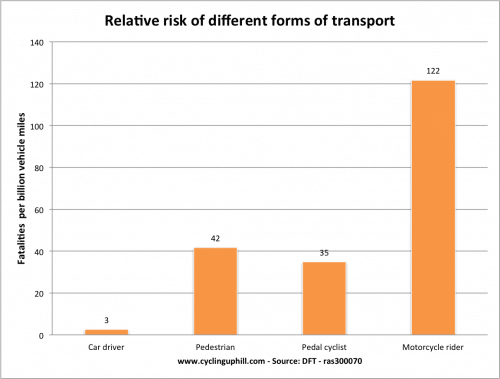 Four times as many pedestrians are victims of road fatalities than cyclists. In the post war period there has been a significant improvement in reducing road traffic accidents. However, although cycling and pedestrians have received some benefit, they are now seriously lagging behind motor car safety rates. Also, there is a worrying trend that improvements in the past two decades are being reversed. 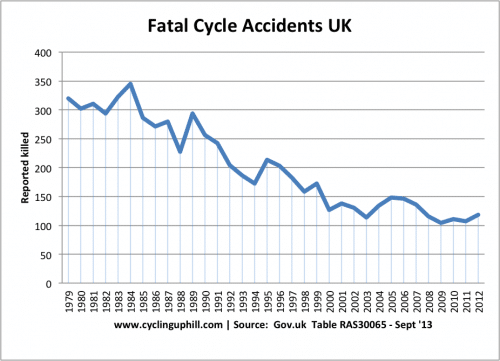 The doubly unfortunate thing is that the increase in cycle rates in the past few years do not seem to be leading to improved cycle safety, we may have hoped for. Countries, such as Germany and the Netherlands have shown that cycle use can be made much safer than in the UK. 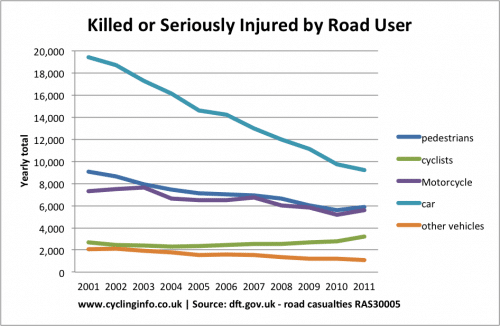 Unfortunately, sometimes the response to cycling fatalities in the UK is the desire to see cyclists removed from the streets, rather than making the roads safer. 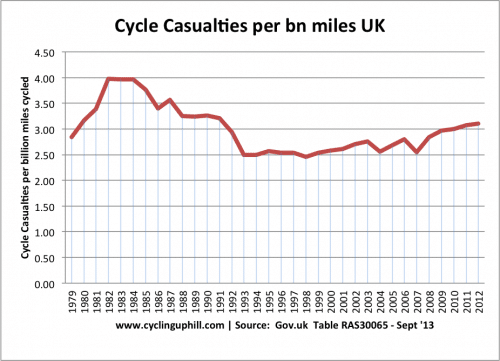 How to improve cycle fatality rates? One thing that may help is to combine the desire for safety roads as a dual effort to improve for safety for cyclists and pedestrians. Many people don’t cycle, but most people do walk. However, irritating cyclist on the pavement may be, they are not the cause of pedestrian fatalities (with the odd exceptions). Pedestrian and cyclist have more in common than many would believe Lower speed limits in town, cracking down on drivers who use mobiles e.t.c, better road planning can help more than just cyclists. Cycling is incredibly safe. I promise you I could cycle around a park all day every day for a long time without coming to any great harm. 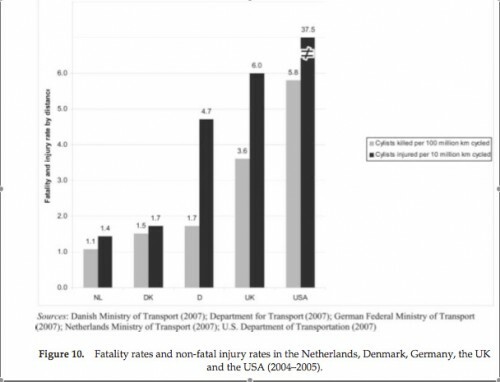 Similarly cycling in the Netherlands is much safer than it is here. This article is about “How safe is cycling on Britain’s roads?” which is a very different subject. Perhaps a rather pedantic distinction, but I think it’s wise to be mindful of where the danger is coming from – whether we’re talking about the safety of cyclists, pedestrians motorcyclists or drivers. In the overwhelming majority of cases the damage is done by motor vehicles. Of course you’re right that statistically cycling, even here, is relatively safe (although I would point out that this is skewed by the fact that cyclists, unlike walkers or drivers, are a self-selected demographic consisting generally of younger fitter more confident travelers – lets get the kids and grannies out cycling on dual carriageways and then ask how safe it is?). But while every individual untimely death is a tragedy, surely it’s the subjective safety which is the bigger issue? The thousands who want to cycle but find it too scary, generally from personal experience or observation – not media reports or statistical evidence. Considering the huge external costs of motoring, especially when so many car journeys are so short, making safe space for cycling as the Netherlands have done, would not just have the benefit of saving lives previously lost in “accidents”, but would also get a lot more people on their bikes in the first place, helping avoid the silent killers you refer to. Thanks for comment Tim. All makes good sense. Thanks also for letting me know about problems with comments. Some really informative content here, can be difficult to find up to date statistics for this. I’m thinking of kick scooters because you can use them on sidewalks. It will be interesting to see how kick scooter safety compare to pedestrian and cyclist safety. You can get those that have fat tires to prevent them from getting stuck in potholes. The main concerns are driveways and intersections especially when vehicles turn right next to you. Wide roads can be scary. Slowing down when crossing might help. The studies should say whether the pedestrian or driver was at fault and how they were hit. There has to be some way of avoiding pedestrian-driver conflict like upgrading traffic lights. When the walking man sign is on, parallel traffic light is green. If the driver didn’t see the pedestrian, it’s so dangerous when making a turn.